Allan Markin is the retired Regional Dean of the Penticton Campus of Okanagan College. He has a doctorate in English Literature from the University of Calgary, having also conducted research in the rare books libraries of the British Museum in London and at Yale University. An award-winning actor, he recently released his third CD and is now directing The Man with the Plastic Sandwich for Penticton Chamber Theatre which plays this weekend at The Cannery Stage. He is president of the South Okanagan Performing Arts Centre Society. He has been married to Evelyn for 50 years and they have two grown children. With his new play opening Thursday he spoke with Herald editor James Miller about his “eclectic” life. HERALD: What music did you enjoy listening to growing up in the 1950s and 1960s? MARKIN: Rock n' roll of course, but also classic country (especially the gritty hurting songs.) I used to do a high energy version of Little Richard’s stuff, thinking that I could be the next Little Richard. Then we got a black and white TV and I realized that he didn’t look anything like me. HERALD: Are you surprised that young kids today are listening to classic rock, many of the songs you grew up with? MARKIN: Not at all. Most people, regardless of their age, have an affinity for music that has endured. There’s an elegant simplicity to classic rock which makes it enjoyable on many levels... lyrics, arrangements, musicianship. I strongly believe that all genres of music have their classics, which is large part of their appeal. HERALD: When did you get bit by the theatre bug? MARKIN: In the 50’s playing rock n’ roll. Live performances must have a strong theatrical element to be successful. It wasn’t long before I got to really enjoy applause. Theatre quickly became the next logical step, so I got serious about it in the late 70’s when I was teaching English at North Island College. I was a founding member of the Portal Players in Port Alberni and produced, directed, and acted in many productions. HERALD: How does one go from being a high school drop-out to earning his PhD? MARKIN: I was always an inveterate reader, despite growing up as a Doukhobor in a home where books were very scarce. Our local post mistress recognized my love of reading and always insured that there was a steady supply of reading material for me when she ordered books from the Victoria Travelling Library. Later, after dropping out of high school to play music and do “stuff” that I prefer not to talk about, and many dead-end jobs, I realized that my wife was a teacher and if I was to “keep up” with her and her educated colleagues, I had to do something with my life. So I started out to become a teacher. Then I won many scholarships, including a coveted Canada Council Fellowship, and didn’t stop until I completed a PhD. 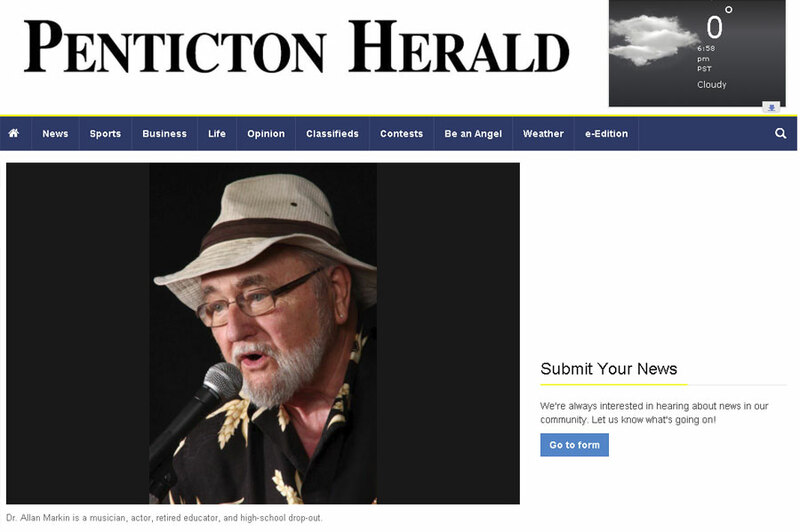 HERALD: You came to Penticton in 1988 to Okanagan College and worked there for 25 years. What is your best memory of the time spent there? MARKIN: Those were exciting times. The efforts to build the college into university status, building the second building on the campus, and working with terrific faculty and staff. I do miss those folks. On the “fun” side, I really enjoyed putting on several Mad Hatters Balls to build the campus profile in the community and raise funds. HERALD: Of your time on the stage in your younger years, what was your favourite role? MARKIN: That’s easy. Tevye in Fiddler on the Roof. HERALD: Are songs like “Tradition” and “If I Were a Rich Man” challenging to perform? MARKIN: For me, yes. I have no musical training (wish I did), so singing with a 22-piece orchestra was a huge challenge. Fortunately I have a pretty good ear. In truth, however, once I put on Tevye’s big boots I became him and the rest just flowed. I know this sounds a bit clichéd, but that’s how it worked for me. HERALD: You’re now directing The Man With the Plastic Sandwich. What an unusual title. MARKIN: I saw this play many years ago and immediately wanted to do something with it. I’m grateful for the opportunity to direct this very funny play with some serious and sobering touches. Life for the main character is like a “plastic” sandwich. He’s in quite a funk, having just lost his job. A tough spot for a man of 50 to be in, so he sits on a park bench and contemplates his future. Advisors stop by the provide unwanted assistance, and hilarity ensues. Theatre lovers will never look at a sandwich the same way again. HERALD: Why will audiences enjoy this play? MARKIN: It’s a romp, truly funny and very entertaining. HERALD: You’ve just released your third CD. What was the inspiration behind the project? MARKIN: For sure it was not to be discovered. I have no illusions about that. I style myself a singer-songwriter-storyteller with a desire to share my work with the public. I think it was Keith Richards who said that picking and singing alone in one’s basement can become pretty boring. I’ve spent the last two years writing and recording; now I’m looking forward to getting out and doing some live shows. The full range of my musical activities can be found on my web site (www.allanmarkin.com). HERALD: What’s your favourite song on the album and why? MARKIN: This album is called “A Six Pack for Love” and my favorite is “Cowboy Mid-Life Crisis Blues,” which pokes fun at a “cowboy” who sets off on a quest for freedom (that mid-life crisis thing) and by the end of the song we see him sleeping on a park bench. I should say that all the songs in this collection have enjoyed very good international radio play. HERALD: As president of the South Okanagan Performing Arts Centre Society, how realistic is it that Penticton will ever get a performing arts centre? MARKIN: I guess I’m an eternal optimist, so I believe that the time will come when Penticton will realize the value of seriously investing in a purpose-built facility that will fill a huge deficit in our arts and cultural infrastructure. It is the arts, broadly speaking, that strengthen a community’s soul and leave an enduring imprint on our lives. HERALD: What one-word best describes U.S. president Donald Trump?